Who are the teams to watch? With the first race scheduled for the 10th October here are two teams from the Hobie® 16 & 18 fleet to watch. Who will you be following? I started sailing Hobies when I was 14 on an 18′ but quickly changed to the 16. In 2005 Jolly and I started sailing together so this is our 11th year as a team. In 2005 we went to the Worlds in South Africa where we placed 45th in the Open and I won a Bronze at Youth with a different crew. We trained a lot the following years being in the water almost every weekend and in the 2007 Worlds managed to get 10th place in the Open. Different complications have made it difficult to attend the other World Championships celebrated since then but we are eager to go the next ones to measure ourselves. Along the 11 years together we won the 2008 and 2011 North American Championships and have been runner up in 2012 & 2015. For Puerto Peñasco we expect it will be a good, tough week of racing with the list of talented sailors registered. Our sights are set on winning the event but most important of all to have a fun week of sailing and camaraderie! I first sailed a Hobie 16 in 1975 as a crew for my father Stan Korzeniewski. It didn’t take long to want have the stick in my hands!!! (That first season we didn’t even use a tiller stick. We thought it didn’t feel right). Since I have sailed and raced Hobie 14, 16, 17, 18, Tiger, Wildcat, 20, Inter 20, Corsair 31 and a whole a lot keel boats. 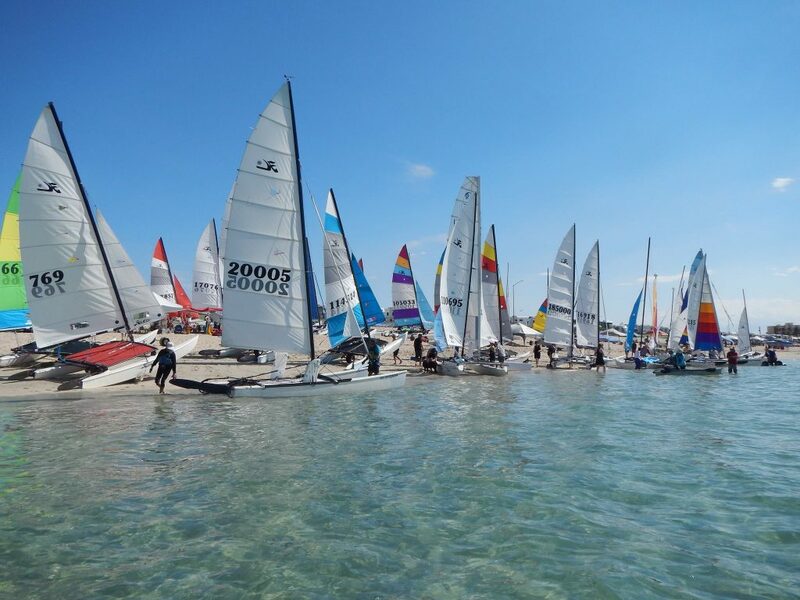 Catamaran racing is my favorite, especially the Hobie16. It’s been a lot of years watching the rock stars from the back, then the middle and now I even get kind of close to them. It has always amazed me how open with their knowledge most of the top sailors are. I am from a Hobie family. There was a time when you could have a many as seven different boats at a single event all from the Korzeniewski family. My favorite racing moment was winning Madcatter 2008 with my daughter Erika when she was 13 yrs old. I am truly grateful of the friends, the travel and the experiences that I have gotten to enjoy thru racing and sailing a Hobie Cat!! 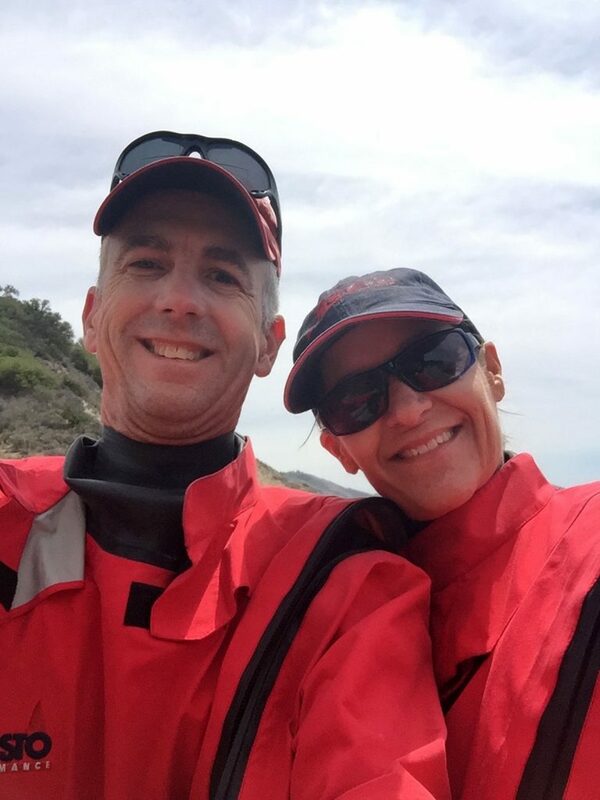 I met my wife (Susan) at a Fleet Event and went night sailing that first night (til about 2 in the morning). I am currently the Division 3 chair here in Northern California. I have sailed most of my life on monohulls and raced 16s a little in college. In 2010 after not sailing for almost 15 years I got the bug again. The Hobie 18 was my choice of boats and since then I have owned over 28 Hobie 18s and many other boats. 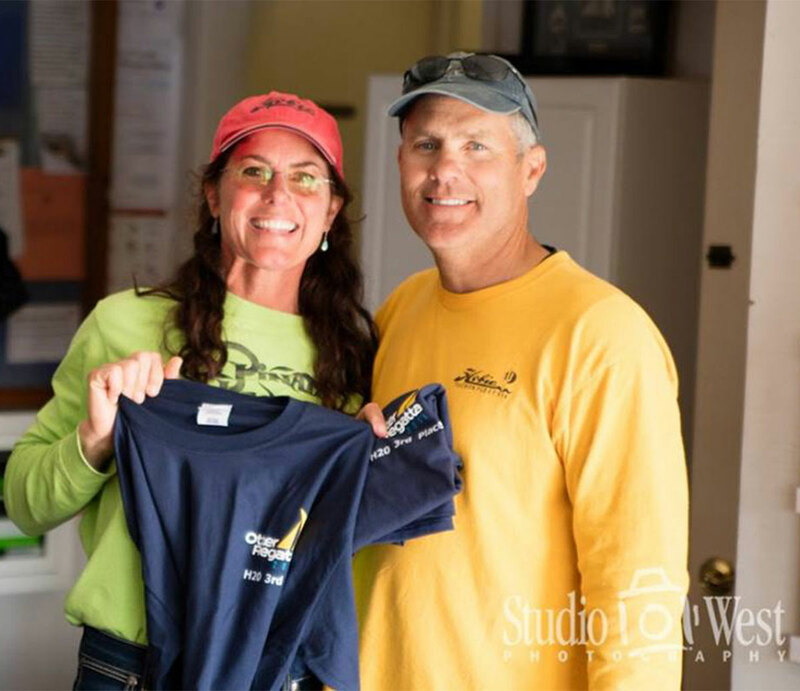 Myself and others restared Hobie Fleet 259 and have hosted multiple regattas including the 2015 Hobie 18/Hobie 20 North American Championships. Currently I am also a director at San Luis Yacht Club and I am in the middle of introducing a small boat sailing program centered around the Hobie Wave. Mostly I have focused on rescuing the Hobie 18s and putting them back in fleets across California. In the last few years my wife and I have also fallen in love with the Hobie 20. 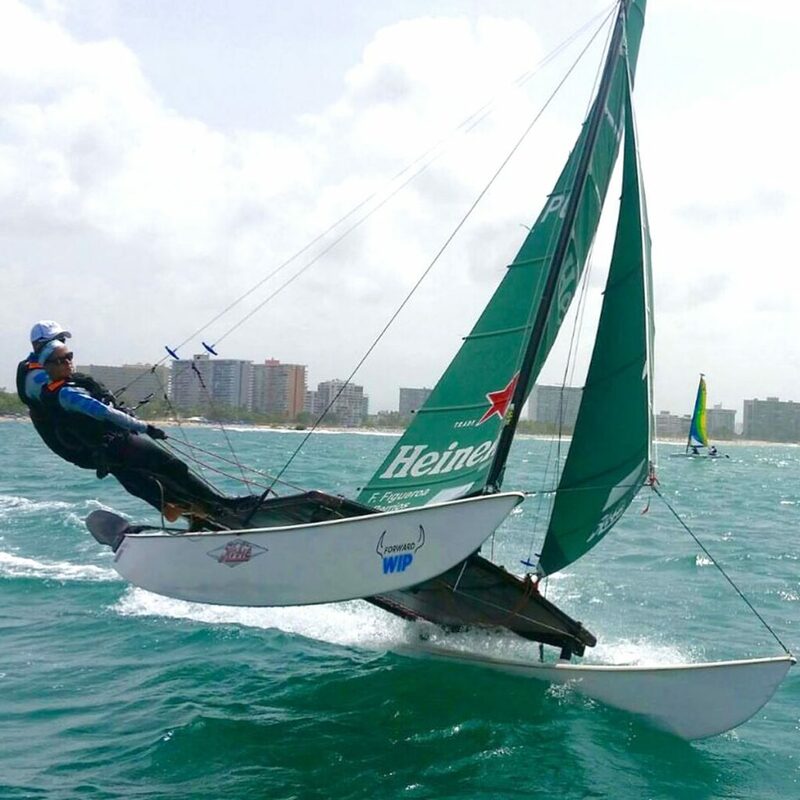 We now race both boats and have really enjoyed the mature and high competition level of the Hobie 20 fleet. We now attend on the average about 15 regattas a year and try and make most of the big Hobie 18 and Hobie 20 events. I would be nothing without my fantastic crew and wife. Kathy Erwin has been my crew from day one and “will not be left on the dock”. She is athletic and fearless. Our strength is heavy weather sailing as the adrenaline takes over and our competitive spirit drives us. Barbie and I are really looking forward to sailing in Puerto Penasco again. It will be a homecoming, of sorts, for us. It was the site of our first ever Hobie regatta. We used to live in Arizona and would trailer our Hobie 18 down to Rocky Point to pleasure sail. One weekend in 1998, we happened to be on the beach the same weekend as the Pinata Regatta. We were watching the goings on with interest but from afar. On Sunday morning, Rex Mitchell approached us and told us his crew wasn’t feeling well and asked if I would like to crew for him. Not knowing how weight sensitive a H16 is Barbie asked if my son, Jim, could also go along. Being the great guy that he is, Rex agreed. My son and I were instantly hooked on racing! It soon grew into an entire family affair. Before Jim and Jenni went off to college, there were many Division 11 regattas with the entire Doty family on the water on three different boats. 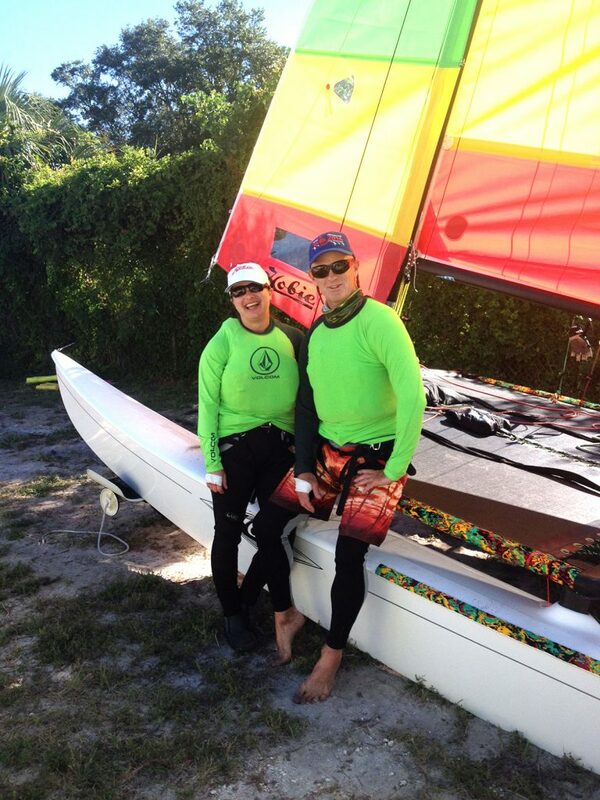 Now as empty nesters, Barbie and I enjoy going to as many Hobie 18 and Hobie 16 North Americans as we can. We really enjoy the camaraderie amongst all the sailors, many of whom feel like family to us.